This lovely book is a celebration of books and the way they impact our lives. 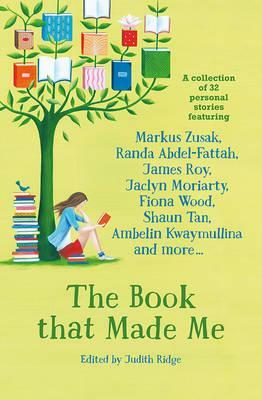 Come on a journey with some of Australia’s and the world’s most acclaimed authors as they reveal the books that influenced them and the role they played in shaping the people they have become. The Book That Made Me features a collection of 32 personal essays by authors such as Cath Cassidy, Rachel Craw, Ursula Dubosarsky, James Roy, Fiona Wood, and the wonderful Shaun Tan, who also provided the black and white illustrations included in the book. As an added bonus, this unique text also contains information on all the authors featured and the books they have written. This book was created by Judith Ridge, one of Australia’s leading experts on literature for children and young adults. Judith has done an amazing job collecting and compiling stories from world renowned authors of all genres. All royalties from this book go to the Indigenous Literacy Foundation, which sends books into Aboriginal and Torres strait Islander communities and supports young Indigenous readers by providing books in both Aboriginal (First) languages and English. The Book That Made Me is beautifully presented with gorgeous illustrations and photographs littered throughout the pages. The cover of the book is designed using a soft colour palette that will inspire readers to pick up a copy. I recommend this book to readers of all ages. It is inspirational and informative, and book lovers will devour every page.